A man burns a Japanese flag in China protesting the nationalizing of the Senkaku Islands. I usually stay away from political issues. And for the most part I will not address the lengthy and complex historical issues that have led to the current conflict with China and the ongoing conflicts with the Korean countries. In general most Japanese do not speak well of their own country. They may have feelings of respect and appreciation for their country but rarely articulate it as "pride." They seem to be confident in Japanese tradition and culture, but are shameful of its current state of economic and moral decline. It's economic situation is an objective reality but its moral situation is certainly a subjective topic of discussion. When the Japanese government purchased the Senkaku Islands from their private Japanese owner, Japanese saw nothing wrong. Apparently the Chinese government and its people thought differently. The leaders in the Japanese government claim that it nationalized the islands to prevent them from being developed further by the building of structures supported under the right wing mayor of Tokyo Shintaro Ishihara. The Japanese government thought such potential action to build on the islands surrounding China might cause even greater damage of relations between Asian powers. They saw nationalization as a prevention measure not an aggressive action. One thing for sure is the nationalistic response in China is quite stark in contrast to that of Japan. 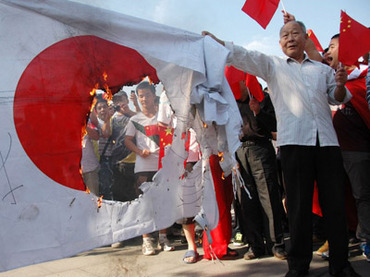 Japanese are not burning things, rioting, or posing any danger to the large Chinese population in its country. There now finally seems to be demonstrating taking place in Japan in response to the volatile reaction of the Chinese towards the Japanese. Some might say that the Japanese government perhaps is attempting to stoke the fire of nationalism in Japan which seems to be very dim, especially with the long stagnant economy and the catastrophic tsunami and nuclear meltdown in Fukushima in 2011. By taking the hard line it forces a violent reaction which would in turn spark a Japanese public reaction to support their struggling government. It is clear that the Japanese government wants to get the attention of its people who seem to be indifferent or frustrated with the political state of Japan. One might argue that a sense of national pride and a little trust in the government might not be entirely a bad thing for Japan. However, I think there needs to be some serious house cleaning that needs to happen first. But even with all the media attention most experts do not see the situation escalating towards war between Japan and China. They are big trade partners and any full scale military measures would most likely result in an economic collapse in both countries. Looking toward the future of Japan, I see the samurai spirit of Japan being stirred up by all these things happening. The samurai warrior is the protector and is governed by loyalty and justice. The Japanese are a strong people who have a history going back thousands of years. I do not think they will back down if put in a corner. According to a recent survey done in the light of the conflict, 34% of Japanese polled believed the government should invest more money into the defense of Japan by the Jieitai 自衛隊 (Japanese Self Defense Force), the current name of the Japanese quasi-military. Officially, the Jieitai cannot fight in war or take part in an invasion of another country even if it is accompaning an ally. The U.S. government has made it so that the Japanese can never make war or maintain a military. The true reality of situation is that the Japanese are in the midst of an internal struggle of how to view itself in the world and even more the particular region of Asia. Whatever happens I hope and pray the best for them. No matter what has happened in the past they have been through a lot as a country the last few years.